Will this man ever stop writing books on Madras that is Chennai? Certainly not as long as he can. Today, at the Museum Theatre (venue well chosen), to cap Madras Week celebrations for the year, the first volume of Madras (Chennai): A 400 Year Record of the First City of Modern India, edited by S. Muthiah, was released by the Tamil Nadu Governor, Surjit Singh Barnala. The second volume is likely to be launched in April, and the third during Madras Week next year. The three volumes will be the result of a collaboration between the British Council and the Association of British Scholars Chennai (ABS). The thought for the three-volume Madras Gazetteer as it was originally planned to be called arose during a meeting Muthiah had with Venu Prasad who was then president of the ABS. No serious work had been done on the history of Madras until then, and Prasad’s enthusiasm led Muthiah to start work on the gazetteer. The result was that about 50 writers contributed, about 60 per cent of them experts from the ABS, and the remainder experts from outside. So, when the third volume is released next year, we will see the most detailed history for any city in India being published. The first volume released today is about ‘The Land, The People, & Their Governance’; the second will be on ‘Services, Education & The Economy’; and the third on ‘Information, Culture and Entertainment’. Muthiah’s premise, as a historian, has always been that Madras, till the 1770s, was the capital of British settlements in the East. Whether it was primary or technical education, basics of medical treatment, or municipal governance, Madras showed other Indian cities the way, registering a first in each case. The three books will be factual and based on documented facts. 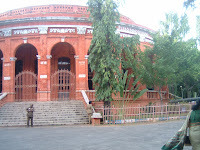 It will be a good starting point for any serious researcher of Chennai’s history. Present at the launch were Sir Richard Stagg, British High Commissioner in India; Mike Connor, Deputy High Commissioner; and Chris Gibson, Director British Council, South India, and P. M. Belliappa, president of ABS. Gibson described the first book as a saga of the persistent efforts by the ABS. Connor said that Muthiah’s books on Chennai were compulsory reading for all British Dy High Commissioners. He called Muthiah a chronicler, balladeer, storyteller, editor, author and a one-man-army. Quoting Oscar Wilde, he added: Anybody can make history; only a great man can write it. Stagg said that education would define India’s success in the coming 50 or 100 years. Indo-British ties had great potential in this area. The new generation was unaware of history and more concerned about the future, he added. Outside, refreshments included hot piping dosas, vadas, jilebis and coffee. Picture shows a view of the Museum Theatre today an hour before the programme, with tight security in place. Cameras were not allowed inside.